I lived more in this one day- marching 20 miles from Canterbury to the white cliffs of Dover and on to France, than I have in a while! 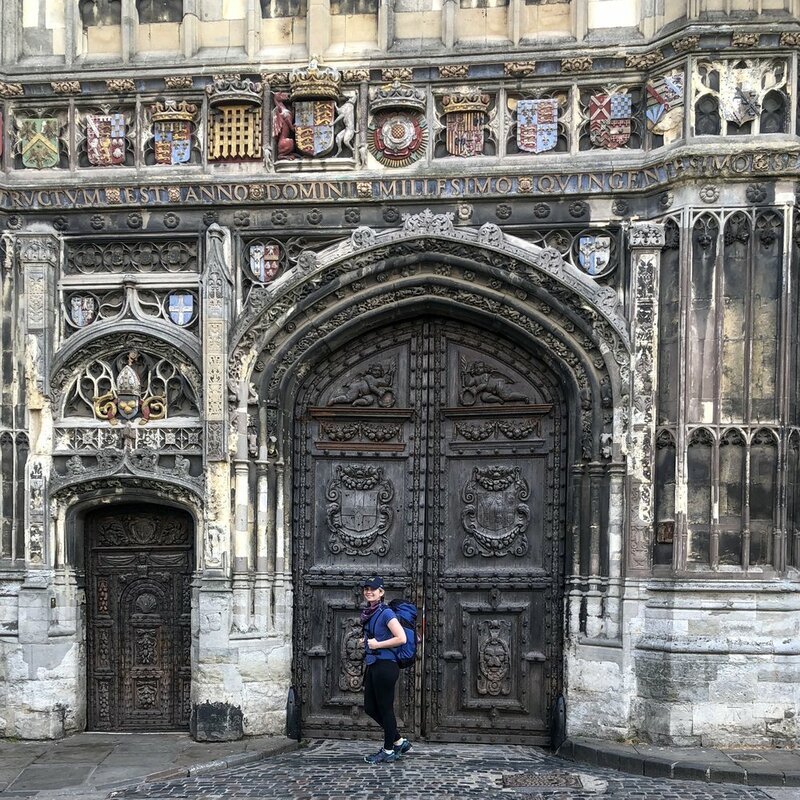 I started out on the empty streets of Canterbury, saying a prayer inside the cathedral grounds at 7:00am to start my trip. I made not less than one wrong turn before exiting the city limits. I met dogs, people, people walking dogs, and asked for directions everywhere! At one point I was lost in a field of daisies and freed a baby bunny that was caught in a wire fence. I think the growing bunny just misjudged a small link of the fence it could squeeze itself through, and got its head and ears before being stuck, like a chubby finger on a ring. I felt a range of emotion watching the sweetest thing I have ever seen squeak and wretch and nearly suffocate itself clawing and pushing for a way out. I couldn’t walk away and leave it to die, but I also was very scared myself to terrify the poor thing further by handling it which stressed it terribly. I did not know how to wrench something so delicate free. The animal finally came to a point of exhaustion with struggling and I was able to put a finger of space between its neck and the fence wire to cut the bunny loose with nail clippers from backpack. I felt such relief watching it hop away. This photo is or after the incident, where it either trusted I was not a predator enough to let me close or was still catching it’s breath. Sometime after the baby bunny incident, I stopped at the Duke of Cumberland pub in Barham to ask for a water bottle refill and left with a terrific stamp of the Duke himself, (a hero in the war against the scots) on my pilgrim passport and a cadbury bar. The humanity! Barham to Lyddon, Lyddon to Dover, the mileage itself felt epic. I was having a lot of trouble navigating from the trail markers, but I felt I had to make good time to Dover though, motivated to honor the ferry ticket i had already bought for 4:30/5:30pm, and the constant knowledge I only have 90 days in the EU. So instead of backtracking to pick up the trail and risking getting lost in the wrong direction, i just followed my compass SE along country roads and hoped to pick up the trail where I could - even if it was the Dover ferry! A looser interpretation for sure, but I decided early on that my main concern was to go the distance and not be turned around. My second stop was Temple Ewell and at this point I wanted to ditch everything. My stuff was heavy to carry on my back all day, and that’s a metaphor and not a metaphor. I also experience being pretty hungry for lunch and walking for miles before finding a grocery store at 3pm in River for a sandwich. And yes, somehow at the end I was following the River path to avoid uphills and empty into the sea! The city scene gave me so much life after the day I’d had! There were points Dover seemed out of reach, so when I saw the white cliffs, (well, first an Indian take out restaurant called ‘White Cliffs Tandoori’ 😂) my heart nearly burst. I met a lovely American family of fellow foot passengers on the ferry. It’s like I also forgot how nice it was to have a real conversation after being to myself walking. It was a great experience, and I truly felt that ferry was more luxurious than the original titanic after the day I had!